Glenbuchat Heritage - 136 Obituary for Janet Buchan nee McNicol. 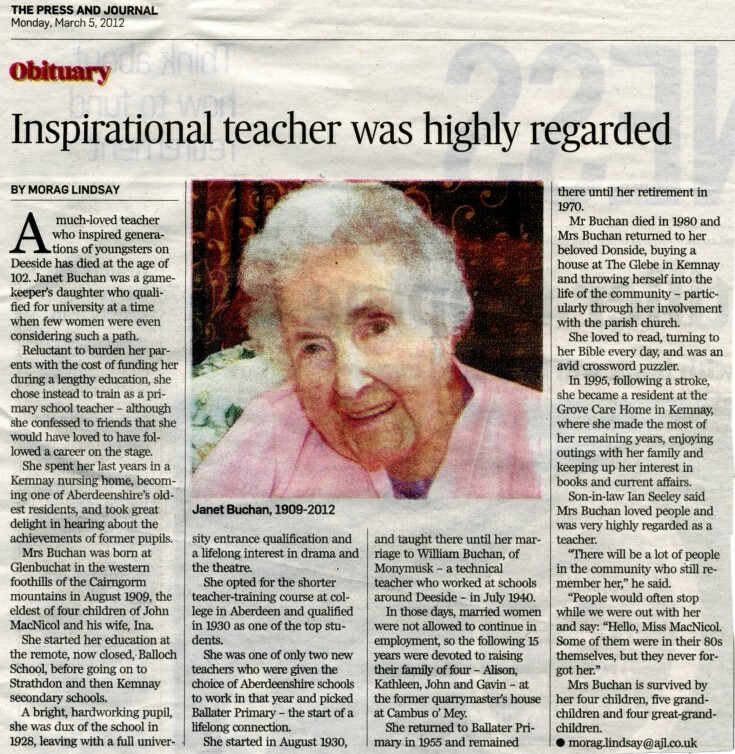 136 Obituary for Janet Buchan nee McNicol. Janet Buchat had been born and brought up in Glenbuchat and died at the age of 102. The following comment is from another pupil at the school who comments about a member of the McNicol family. In the Army you had to mix with people from all over and from a range of backgrounds. I coped pretty well. I considered myself anyone's equal. Some of those Junior Officers, well you just couldn't work out how they ever got selected for their position. I had a friend- he was in Burma and he was a sergeant, mind- and he wrote a letter home in which he commented, 'Some of the officers we have out here think they have the brains of a Field Marshall, but really they haven't even got the brain of a field mouse!' Well, the letter was censored and he was hauled up in front of the Colonel and he said to him, 'Well, McNicol, probably what you have written is quite true but you can't write things like that, you know. You are to be reduced to the rank of Corporal for a term-but you'll get your stripes back later. In the meantime I must make an example of you'. That McNicol had actually been born in the same room and the same house as I had been. His father had been the head-keeper at Glenbuchat before my father was. And he'd been at the Balloch too. He's dead now. b. 1807, Glen Orchy, Argyllshire, d. November 13, 1894, Sandside,Reay Caithness. Died November 13, 1894 in Sandside,Reay Caithness. Will states "gold watch" personal gift from the Duke of Buckingham. A BALL EXTRACTED AFTER TWENTY-FIVE YEARS. b. August 01, 1840, Killin, Perthshire, d. October 10, 1909, Balvonie, Inshes, Inverness. Alexander Montgomerie McNicol, He married Mary Sheed in 1866.
b. June 28, 1843, Killin, Perthshire, Scotland, d. December 08, 1894, Shurrery Lodge, Reay, Caithness. b. March 31, 1845, Killin, Perthshire, d. March 03, 1913, Lochee Park Lodge, Dundee,Angus,Scotland. b. January 13, 1847, d. July 25, 1854, Glenbuchat. b. February 23, 1849, d. July 17, 1854, Glenbuchat, Aberdeenshire. b. February 16, 1851, North Knapdale, Argyllshire, d. July 07, 1935, Dorback Lodge, Revack Estate, Nethy Bridge. b. February 16, 1854, Glenbuchat Lodge, Aberdeenshire, d. April 16, 1942, Sandside, Reay,Caithness. b. July 17, 1856, Glenbuchat Lodge, Aberdeenshire, d. January 11, 1923, North Carolina, U.S.A..
Died July 07, 1935 in Dorback Lodge, Revack Estate, Nethy Bridge. Married Janet Wattie on June 04, 1874 in St Andrews, Lhanbryde, Aberdeenshire, daughter of John Wattie and Grace Cameron. Janet Wattie (daughter of John Wattie and Grace Cameron) was born January 04, 1849 in Strathdon,Aberdeenshire, and died December 24, 1916 in Dorbach Lodge, Nethy Bridge, Invernesshire. Donald Montgomery McNicol, b. February 03, 1876, d. January 12, 1961, County Hospital Invergordon..
b. July 22, 1877, d. January 25, 1963, Riemore, Tomintoul and buried there. b. 1879, . September 19, 1958, Altdachie, Aberdeenshire. b. August 31, 1883, Dorbach Lodge, Nethy Bridge, Invernesshire, d. April 1973, Pinehill, Auchterhouse,Angus. b. 1881, d. December 30, 1916, France, from wounds received in Battle of Somme. b. 1886, d. date unknown. b. 1888, d. date unknown. b. 1879, d. September 19, 1958, Altdachie, Aberdeenshire. Born 1881, and died December 30, 1916 in France, from wounds received in Battle of Somme. June 1916, injured in Battle of Somme. December 1916, died from injuries. December 1916, Buried in Dernancourt Communal Cemetery Extension, Somme Frane. December 1916, Grave reference IV.F.20..
Born 1879, and died September 19, 1958 in Altdachie, Aberdeenshire. Married Robina Smith Robertson (Robina Smith Robertson, b. 1884, d. April 18, 1953, Faichla.) on November 11, 1908 in Public Hall, Alford, Aberdeenshire, daughter of George Robertson (reputedly) and Jemima Pyper/Smith. b. Abt. 1910, d. Abt. 1992.
b. Abt. 1912, d. Abt. 1989.
b. Abt. 1916, d. 1990, Kirkcaldy. (daughter of John Wattie McNicol and Robina Smith Robertson). Died on 11 Jan 1923 in Ashville, North Carolina. Married Mary Helen Tillotson on 10 Nov 1885 in Hanover, New Hampshire. Montgomery Margaret McNicol was born on 27 May 1889 in Providence, Providence, Rhode Island. Died March 17, 1859 in Strathdon. Married (1) Grace Cameron in Strathdon, daughter of James Cameron and Grace Stewart. Isabella Wattie, d. date unknown. Mary Wattie, b. February 21, 1836, d. date unknown. John Wattie, b. November 29, 1841, Mill of Newe Strathdon, d. June 04, 1933, Mill of Newe, Strathdon. James Wattie, b. May 16, 1844, Mill of Newe, Strathdon, d. May 08, 1923, Mill of Glenconrie, Strathdon. Alexander Wattie, b. December 19, 1848, d. date unknown. d. December 24, 1916, Dorbach Lodge, Nethy Bridge, Invernesshire. Delilah Wattie, b. 1832, d. date unknown. I can add information on the family of William Skene McNicol and Janet Wattie should any wish it. My father in law, now 101 years old is their grandson through his mother Mary Wattie McNicol.